Dublin is Ireland’s capital and largest city, offering an endless number of museums, attractions, and entertainment options. We’ve put together a recommended Dublin itinerary to help you get the most out of your 3 days in Dublin. It includes all the main highlights of the city such as Trinity College, the Guinness Storehouse, the Temple Bar neighborhood, and Christ Church Cathedral as well as a few lesser known sites. We suggest using this Dublin itinerary as a starting point for planning your 3 days in Dublin, and you can edit it to create your own personalized itinerary that reflects your own needs and interests. In addition to the 3 day itinerary, we also provide tips on how to get around Dublin, a map of each day’s suggested attractions, tips on where to stay in Dublin, and how to save money during your 3 days in Dublin. Best Time to Visit Dublin? 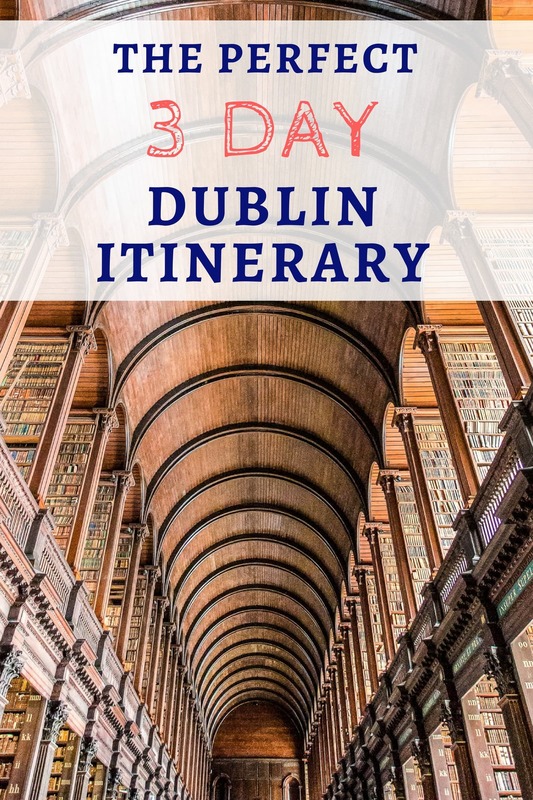 Before we share our suggested day-to-day itinerary, here is some essential planning information on getting to Dublin, getting around Dublin, tips for saving money, how to find accommodation, and further resources for planning and making the most of your 3 days in Dublin. Dublin is easy to reach by plane and can also be reached via a combination of ferry, train, bus, or car. Dublin has one major airport, Dublin Airport with flights coming in and out from around the world. From the airport, you can get into the city via taxi, Uber, bus, rental car, or by booking a private transfer. If you have a Dublin Pass, you can get 15% off of a shuttle transfer from Dublin Airport to the city. Given that Ireland is an island with no bridge or tunnel connections, you can’t obviously reach Dublin directly by train or car if you are starting your trip outside of Ireland or Northern Ireland. If you are arriving from the UK or continental Europe, you can drive or take a bus or train to a ferry port in the UK or France, and then take a ferry to reach Ireland. Dublin Port is the most convenient port for those wishing to visit Dublin. Irish Ferries is the main ferry company to Ireland or you might consider a rail and sail package. The ferries take both foot passengers and cars. NOTE. If you plan to rent a car, please check your rental agreement as bringing a car to or from Ireland may be against your car’s rental terms (particularly taking it on any ferry crossings). For instance, even cars rented in Ireland or Northern Ireland can sometimes not be brought by ferry over to Scotland or England and vice versa. Central Dublin is fairly compact and is best explored by a combination of walking and public transportation. Cabs, Uber, and bike hires are also options. We would not recommend driving in Dublin unless you are planning to stay on the outskirts of the city or visit places outside the city as driving and finding parking in central busy locations can be difficult and parking can be expensive. If you are driving to Dublin, we’d recommend parking your car when you arrive in the city and then use public transport until you leave the city center. Dublin has a good public transportation network which includes public buses, trams, and rail services (for going outside the city center or outside the city). We used the bus several times on our most recent trip and found it easy to use. There are also a few hop-on hop-off (HOHO) buses in Dublin, such as the City Sightseeing Bus. If you have a Dublin Pass, you’ll can get a free one day sightseeing bus ticket. 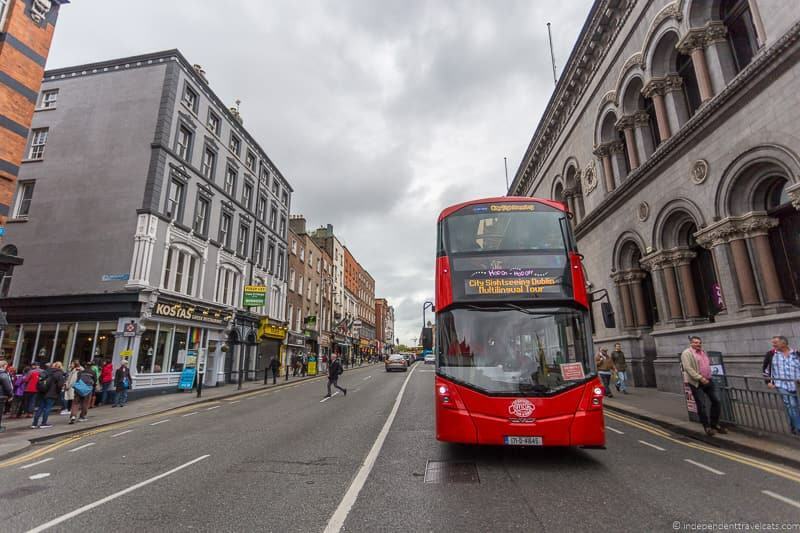 If you plan to use these buses, we recommend doing this when you first arrive in Dublin to get a good overview of the city before you start exploring. 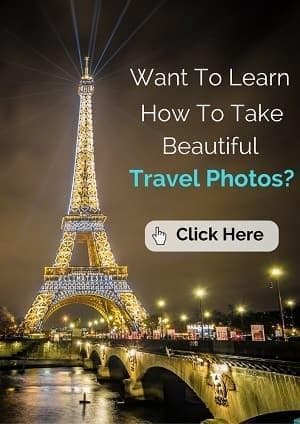 We find these tours are great ways to get a good introduction to a new city although not as practical if you are trying to get from one place to another quickly. We love visiting Dublin at any time of year, and it really depends on your preferences. Dublin is a great year-round destination as most attractions are open year round in the city. But we’d say Spring, Summer, or early autumn would be our recommended times of the year for a first time visit. Although winter is a great time to visit as well as it is less busy and you can enjoy the holidays, but it will also be darker and colder at that time of year. Halloween in October (believed to have originated in Ireland), Christmas in December, and St. Patrick’s Day in March are all accompanied by big celebrations and festivities in the city. In terms of weather, you’ll have warmer days and more hours of sunlight in the summer. It may also rain less. However, whenever you visit, you will want to be prepared for rain so be sure to pack a rain jacket and/or umbrella. Ireland is known as the Emerald Isle, and all that greenery takes plenty of watering, so rain is a possibility at any time of year! There are a range of lodging options in Dublin to suit all budgets and travel styles, from hostels to apartments to B&B’s to luxury hotels. If you are looking for a comfortable good-value hotel, we’ve stayed at a number of mid-range hotels in the city like the Ireland-based Maldron hotels. We would recommend booking lodging in or near the city center to make the most of your time in Dublin. Our current favorite way to find the best price on hotels when traveling in the UK is Booking.com. We find they tend to have the widest choice of listings, good discounts if you use them regularly, and an excellent selection of properties from hotels to apartments. See their Dublin city center listings here to get started. If you’d prefer an apartment or room, then you might also want to check out AirBnB. They usually have the most choices and a good feedback system helps ensure you get a good quality stay. If you’ve not used them before, you can save up to $100 by signing up through this link. If you are not finding what you want on Booking or Airbnb, check out our guide to the best AirBnB alternatives for lots of other accommodation booking options for your trip. As a capital city in Europe, Dublin is not a budget destination but it is also not the most expensive city either. Generally, you’ll find that the main costs are going to be food, entertainment, accommodation, and sightseeing. There are loads of ways to save money. Budget accommodation include hostels, budget motels, and rooms in private homes. You can save money on food by cooking for yourself or getting take away. There are also lots of free or inexpensive things you can do from admiring the city’s architecture and city parks to having a pint in a pub to enjoying a free city concert. 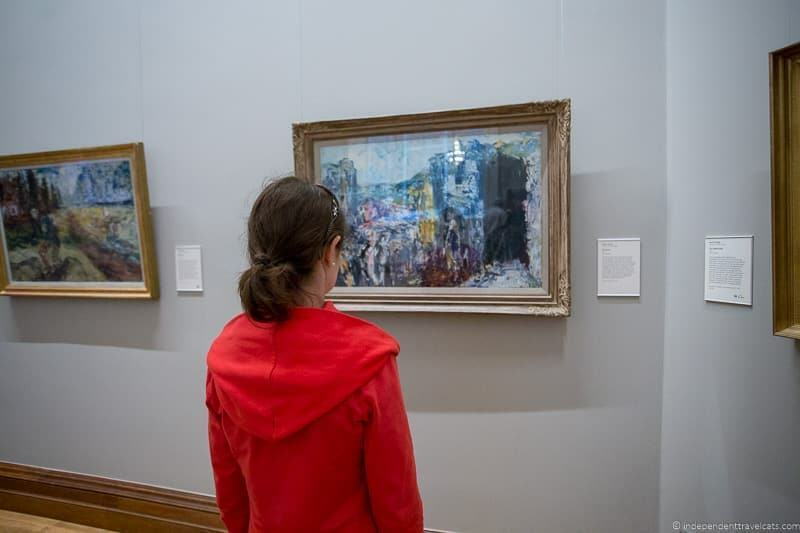 There are a number of great free museums in Dublin which include the National Museum of Ireland, National Gallery of Ireland, Dublin City Hall, and the Irish Museum of Modern Art. Also keep an eye out for discount cards, coupons, and special deals to save money on tickets, tours, and meals. Our favorite way to save money on sight-seeing in Dublin is to invest in a Dublin Pass which allows for free entry into over 25 of Dublin’s popular attractions (see full attraction list). It also comes with a free hop-on, hop-off bus ticket and additional discounts on food, shopping, and tours. It also includes fast track entry to many of the included attractions. We’ve used the Dublin Pass twice when visiting the city, and for a three day visit, the savings can really add up. You can read our review of the Dublin Pass to figure out if it is worth investing in for your trip and more about our experiences using it. Power: Electricity in Dublin is of the 220v standard, and power outlets use the same three pin plug that you’ll find throughout the UK and British Isles. Travelers from most countries, including continental Europe and North America will need a travel plug adapter like these or a universal adapter like this. Be sure to leave electronics that don’t support 220v at home or you’ll need to purchase a voltage converter. Currency: Ireland (the Republic of Ireland) is in the Eurozone, so the currency is the Euro. You can get Euros from ATM’s, banks, and currency exchanges, although credit cards are of course widely accepted throughout the country. Note that if you plan to visit Northern Ireland, you’ll need to switch to GBP as the currency in the UK is pound sterling. Internet: Internet access is easy to find in the form of WiFi all around the city, as well as in the majority of hotels and coffee shops, so you shouldn’t have any trouble getting online. You can also pick up local SIM cards if you have an unlocked phone. For more options on getting online when travelling, check out our guide to getting online when travelling to help you figure out the best options. Water: The water in Dublin (and Ireland) is perfectly safe to drink unless otherwise posted. If you don’t like the taste, bottled water is widely available. Safety: We’ve never had any problems with safety when visiting Dublin, just take basic precautions with your valuables and personal safety, and you should be fine. For information on events, happenings, and more ideas for what to do in Dublin, take a look at the official Visit Dublin website. If your travels are taking you elsewhere in Ireland, check out the official Ireland tourism website and our recommended two week itinerary for the UK and Ireland which includes Dublin. There are several great day trips you can take from Dublin. For instance we’ve done a day trip to the Cliffs of Moher. Day tours also visit Belfast and the Northern Ireland Coast which has fantastic attractions like the Giant’s Causeway, Titanic Museum, and the Dark Hedges. If you are looking for a guidebook, you might want to get a copy of the Rick Steves’ Dublin Snapshot Guide or latest Ireland guidebook. For a good street map to help you navigate Dublin’s city center, we personally love the laminated Streetwise maps by Michelin. Dublin has a large number of attractions, museums, shows, and potential things to do. This can be overwhelming for first time visitors so we’ve put together our suggested 3 day itinerary that takes in Dublin’s most popular attractions, museums, and neighborhoods. We’ve also tried to arrange them in a logical order so you spend less time traveling around the city and more time sightseeing. Use this as a guide and starting point for planning your 3 days in Dublin, not as a definitive itinerary. This itinerary is pretty jam-packed and may be too packed for someone who wants to explore the city at a more leisurely pace. It also reflects some of the most popular highlights, but you’ll want to add or substitute places that reflect your own special interests. For example, it doesn’t include attractions like the Dublin Zoo, Avia Stadium, the botanical gardens, the wax museum, or trips out to Dalkey or Malahide Castle. Be sure to check on admission days and hours for any must-see attractions before you set out as some attractions close for one day per week, or may be closed due to a special event or renovation. Many attractions have reduced winter hours and longer summer hours. For all attractions with an admission fee, we’ve noted there is an entry fee by writing “(fee)” next to them. Note that since many people use the Dublin Pass, the attractions that are included on the Dublin Pass (at the time of this writing) are starred (*) denoting that passholders receive free entry so they have “(fee*)” next to them. We do our best to provide the most updated information, but things change so you may want to double-check fees and check the latest list of attraction included by the Dublin Pass before your trip. To help you visualize our Dublin itinerary we’ve put it into a map, showing all the locations above divided by the three days in Dublin. You can see this map on Google Maps here or double click on the map image below to explore or save the map. For the first day of our suggested 3 day Dublin itinerary, we have you exploring the area south of the River Liffey in the western part of central Dublin. Today you’ll learn about Dublin’s medieval and Viking past, have a chance to visit the city’s two famous cathedrals, pay a visit to one of Ireland’s most famous prisons, and end your day of sightseeing with a pint of Ireland’s most famous brew! We’re going to start with a visit to Dublin Castle (fee*). There has been a castle on this site since 1166, although most of the current complex dates from the 18th and 19th century and doesn’t look too much like a medieval castle anymore. However parts of the medieval castle still exist and the State Rooms of the castle are still used for official state engagements. Many famous figures have visited the castle including Queen Victoria and Queen Elizabeth II, and Dublin-born author Bram Stoker worked as a civil servant at the castle for several years before moving to London. Visitors to Dublin Castle can see the excavation site of the Viking and medieval parts of the castle, the Gothic Chapel Royal, and the State Apartments. You can purchase a ticket for either a self-guided visit of the castle or guided tour. 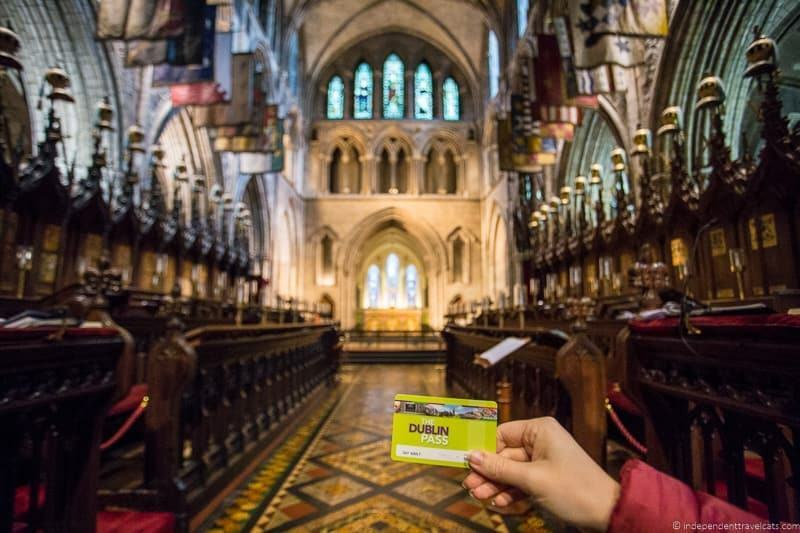 Dublin Pass holders can take a self-guided tour for free or upgrade to a guided tour for just £3 extra. Do bear in mind that access to Dublin Castle may be restricted due to government events or activities, so check the official website before your visit to avoid disappointment. 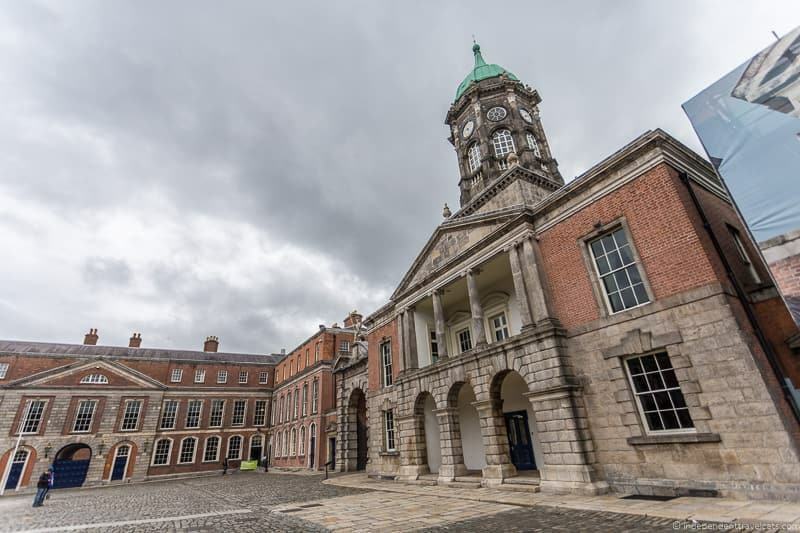 Within the Dublin Castle complex are also the Garda Museum (Irish Police museum) and the Chester Beatty Library museum. Both of these are free and worth visiting, especially the library museum, if you have time. 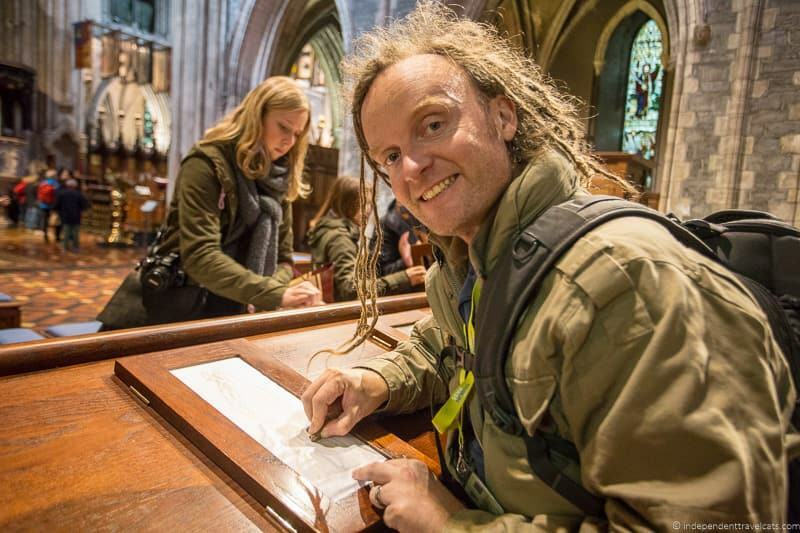 Dating back to 1028, Christ Church Cathedral (fee*) is Dublin’s oldest medieval cathedral and is found in the heart of what was once medieval Dublin. Although it dates back to medieval times, the Christ Church cathedral that exists today is a mix mainly of Gothic, Romanesque, and Victorian elements. It serves as the seat of the Church of Ireland (Anglican church) in Dublin. Fans of the Showtime TV show The Tudors will likely find it recognizable as many of the cathedral scenes from the show were filmed on site here. There is a lot to see at Christ Church cathedral. First there is the beautiful nave and main building, which contains the organ, the Musician’s Corner, and some tombs including the disputed tomb of Strongbow, a medieval Norman-Welsh earl and warlord. There’s also the crypt which is the largest cathedral crypt in the British Isles. The crypt contains a number of items of interest, including monuments, a mummified cat and rat that were found stuck in the organ pipe, and an extensive silver collection. The cathedral’s choir is very well known throughout Ireland and those who enjoy choir music may want to make time to listen to the choir for evensong which is normally performed several evenings a week in the cathedral. You can visit the cathedral as part of a self-guided tour, or join a guided tour (additional fee) that are offered on most days at set times (check website for times). Next door to Christ Church Cathedral is Dublinia (fee*), a fun family-friendly museum which tells the story of medieval and Viking Dublin. Along with the cathedral, this part of the city was at the center of medieval Dublin, although construction and city changes mean that not much else has survived from that time period. 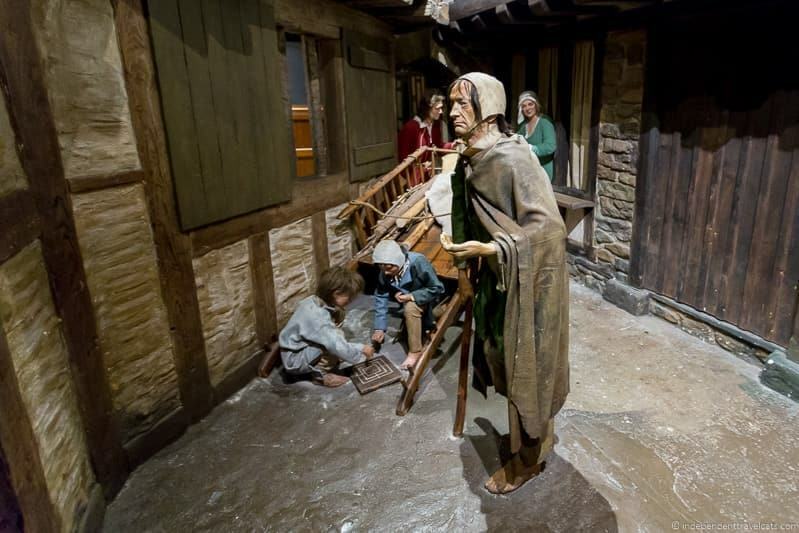 At Dublinia, visitors can learn all about life in medieval Dublin on a self-guided visit, told through various mediums, which includes interactive exhibits. This being medieval times, there is naturally a large section dedicated to the Plague, or Black Death, which was responsible for the deaths of thousands of Dubliners. A part of the museum also covers how archaeologists have unearthed artifacts to help understand and bring the past to life. At the end of the visit, there is also the chance to climb the steps of the medieval St Michael’s Tower. Most tours are self-guided; however, once per day, they do a guided tour in English of one of the sections of the museum with a costumed actor guide. These interactive tours are well worth taking, especially if you have children, and help bring a bit more life into the information. Check times before visiting if interested in the tour. Dublinia and Christ Church Cathedral are next door and connected by the Synod hall and bridge. Both attractions are included for free with the Dublin Pass, but if you are not planning to buy a Dublin Pass but still want to visit both attractions, you can purchase a discounted combined ticket for both at the Dublina’s welcome desk. If you are interested in visiting another cathedral, you can also visit the nearby St. Patrick’s Cathedral (fee*). Dublin is unique for having not one, but two cathedrals and both date back to the medieval period. 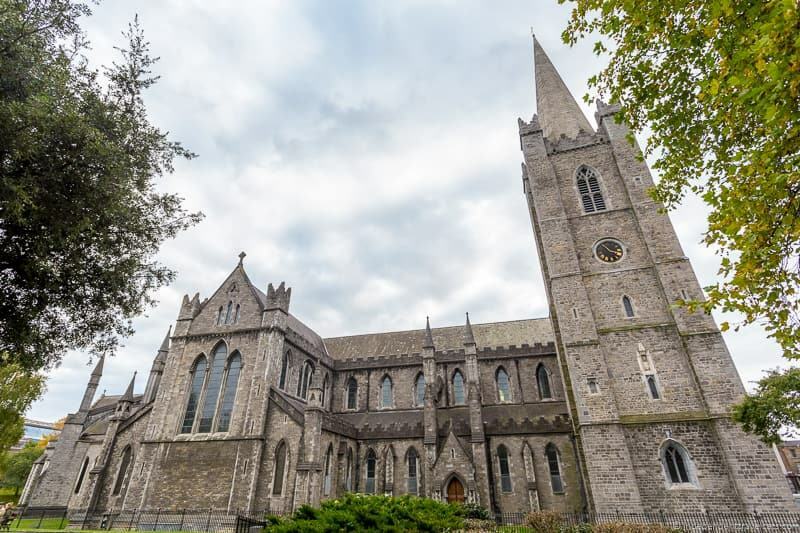 It is believed that St. Patrick’s Cathedral (fee*), founded in 1191, was initially intended to replace Christ Church but for whatever reason this did not happen and the two cathedrals have had to learn to co-exist together. Like Christ Church, it is part of the Anglican Church of Ireland. St. Patrick’s Cathedral is the National Cathedral of the Church of Ireland and its spire makes it the tallest church (but not cathedral) in Ireland and the largest. It is said that Saint Patrick used a well on this site to baptize people in Dublin approximately 1,500 years ago. The author of Gulliver’s Travels, Jonathan Swift, once served as dean of St. Patrick’s and is buried within the cathedral. It is an impressive cathedral and the church can be visited on a self-guided visit. An audio guide is available for an additional fee. Interested in seeing more of Dublin’s Churches? There are loads of churches you can visit in Dublin. If you are surprised like we were that both of the cathedrals in Dublin are part of the minority Christian faith of Ireland (Anglican), this is because both cathedrals changed from Roman Catholic to the Anglican Church of Ireland following the Protestant Reformation. 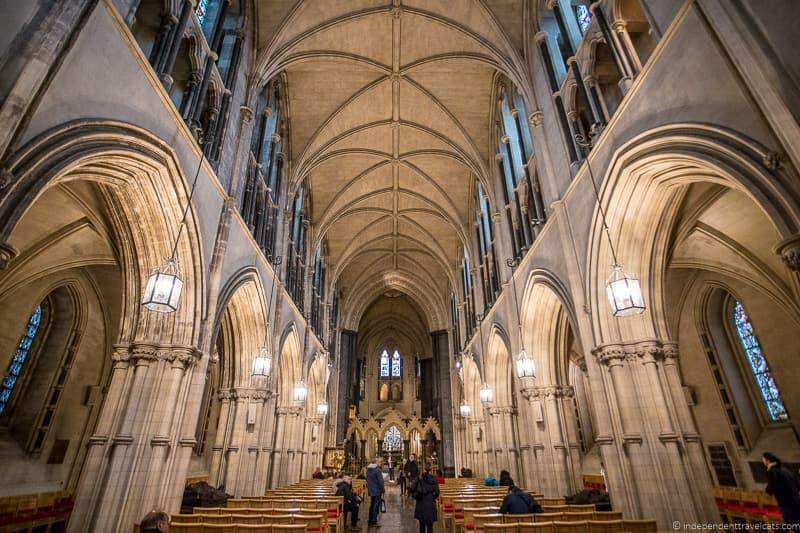 If you are looking for the main Roman Catholic church in Dublin, you might want to visit St. Mary’s Church which is the episcopal seat of the Roman Catholic Archbishop of Dublin. Also if you enjoy church crypts, you might to visit St. Michan’s parish church, an Anglican church with an interesting crypt that is open on most days for public tours. We’re coming towards the end of the first day of our three day Dublin itinerary. Our next attraction is a little further out of the city, but worth the trek if you have the time. Kilmainham Gaol (fee) is a former 18th century prison which is today run as a museum by Ireland’s Office of Public Works. Kilmainham Gaol opened in 1796 and closed in 1924. During this period it housed convicts convicted of crimes ranging from stealing food to murder. In the early 19th century, about 4,000 prisoners were transported to Australia. In the early 20th century, it was mainly used to house rebels and military prisoners, and the leaders of the 1916 rebellion were notably held here and executed. Film fans may recognize this as the filming location for the prison that Michael Caine is held in the original Italian Job movie. 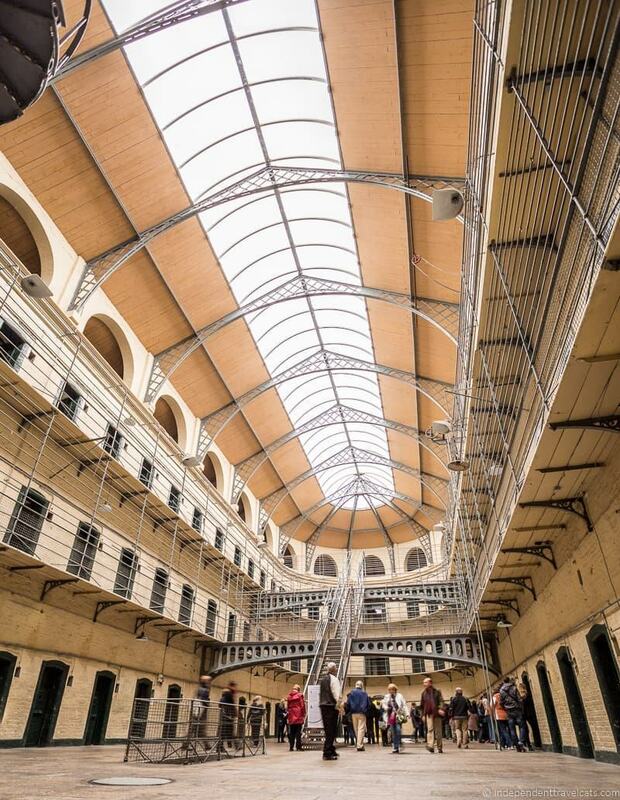 Kilmainham Gaol can only be toured as part of a guided visit, with tickets sold for specific times of the day. Tickets are usually available for walk-ins, however this is a very popular attraction and we recommend buying your ticket in advance online to avoid disappointment. Our final stop on the first day of our three days in Dublin is Dublin’s most popular visitor attraction—the Guinness Storehouse (fee*). We think this is an absolute must for most people when visiting Dublin! It is interesting even if you are not a big fan of Guinness or even beer. The Guinness Storehouse is on the site of St James’s Gate Brewery. This is where Ireland’s legendary drink, Guinness, has been brewed since 1759. It’s quite the success story, with over 50 million barrels of Guinness being produced annually at St. James Gate brewery. The Guinness Storehouse itself is a huge seven storey visitor attraction arranged around a central atrium. The Storehouse was built in 1904 and used for fermentation until 1988, but is no longer part of the active brewery. The tour, which is self-guided, goes across all seven floors, and you’ll learn a bit of everything including the founder Albert Guinness’ story, how Guinness is made, and how the brand’s iconic advertising has changed from the 18th century to now. Once you’ve learnt everything you can about Guinness, the tour culminates at the Gravity Bar on the seventh floor. Here you’ll get to sample a pint of the good stuff (included with your ticket), and admire a spectacular view of the city. Not a bad way to end your first day in Dublin, we think you’ll agree. This is one of the most popular attractions in Dublin so we recommend that you buy your tickets online, which will save you money compared to buying them on-site and you also have access to the fast track queue. You also get free entry and access to the fast track queue with the Dublin Pass. Want more Guinness? 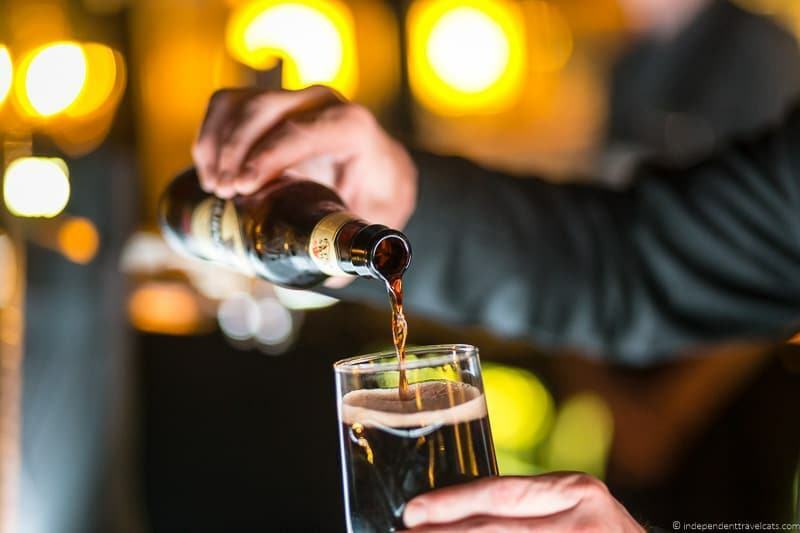 After the Guinness Storehouse closes, you might want to make your way to the Open Gate Brewery at St. James Gate to try some of the latest Guinness beers as well as experimental batches. It is a bar which is located within the Guinness active experimental brewery facility and is currently only open to the public on Thursday, Friday, and Saturday evenings. To visit, you must reserve a spot in advance online and you must be 18 years or older to enter. On the second day of your 3 days in Dublin, we suggest visiting more of Dublin’s classic sites, seeing one of Ireland’s top cultural treasures, taking a break in the city’s most popular green space, visiting one or more of its free museums, and watching sunset over the River Liffey. Then after dinner, we recommend heading out to experience some of Dublin’s nightlife in the famous Temple Bar neighborhood. Today’s itinerary has you exploring the eastern area of central Dublin south of the River Liffey. Trinity College Dublin, officially the College of the Holy and Undivided Trinity of Queen Elizabeth near Dublin, is the only college of the University of Dublin. It was founded by Queen Elizabeth I in 1592 and is widely regarded as the finest university in the country. The college has a rich history and is an impressive place to wander around and visit. One of the most popular attractions in Trinity College is the Old Library (fee), also known as the Long Room. This dates from the 18th century, and houses over 200,000 books which are kept across two floors. 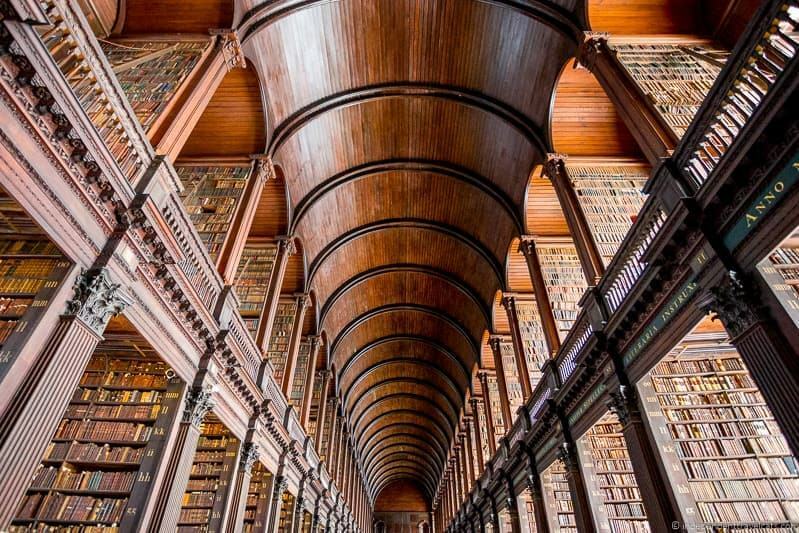 The library is over 200 ft long, and is a sight you have to see when you visit Dublin! When you visit Trinity Library, you can also see a section of the Book of Kells. This 9th century decorated copy of the four gospels is the world’s most famous medieval manuscript and is regarded as Ireland’s greatest cultural treasure. 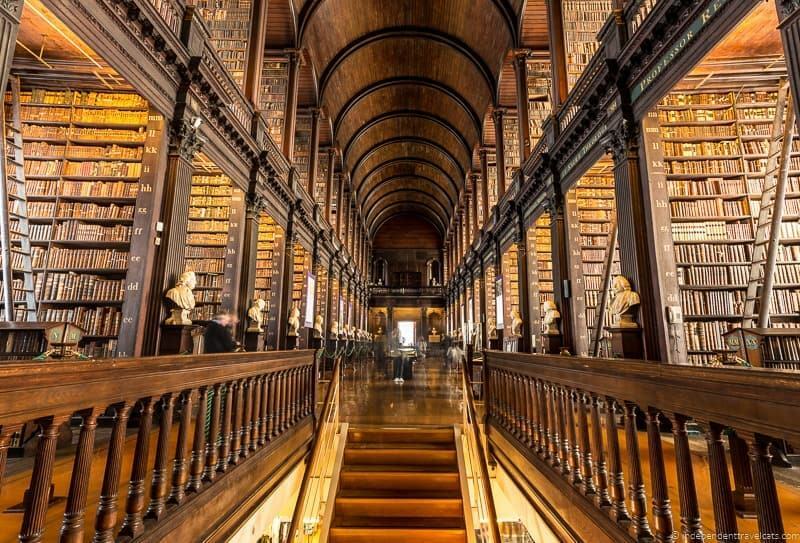 Entry to both the Book of Kells and the Long Room are included in the same ticket, which you can buy directly from the Trinity College Dublin website, or in person when you arrive. No visit to Dublin would be complete without a visit to one of the city’s most famous inhabitants —Molly Malone. Or at least, her statue. 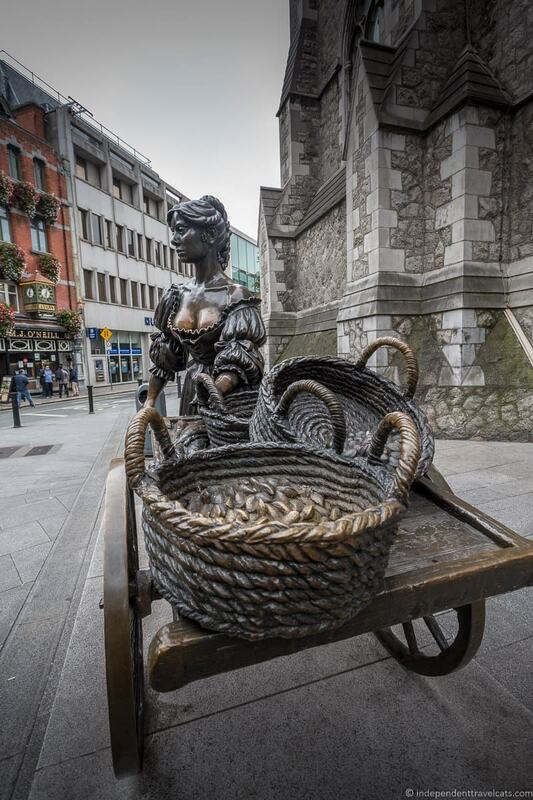 Molly Malone, as you are likely aware, is a fictional character who features in one of Ireland’s most well-known songs, which tells the story of a fishmonger plying her wares in Dublin. As you can probably tell from the photo below, many tourists like to touch her statue, particularly her breasts, and unfortunately this has caused some of the bronze to be worn off. The statue of Molly Malone was historically located on Grafton Street, but due to construction work on Grafton Street at the time of writing, she can currently be found just outside the Irish tourist information office on Suffolk Street. On your walk from the Molly Malone statue to the next site, the Little Museum of Dublin, we recommend walking along Grafton Street. This is one of the best known streets in Dublin and one of the city’s main shopping streets. It’s a lively place with lots of stores, restaurants, cafés, and street buskers (street performers). The majority of the street is pedestrian-only making it a friendly place for walkers and tourists. If you are interested in life in Dublin through the 20th century and up to the present day, then you should consider a visit to the Little Museum of Dublin (fee*). This museum of the people will take you on a journey through life in 20th century Dublin. It has over 5,000 artifacts on display across three floors, including a room devoted to Ireland’s most famous musical exports: the rock band U2. It’s worth nothing that the Little Museum of Dublin, as the name suggests, is a relatively small museum. As a result, visitor numbers are carefully managed, and the main exhibition has to be seen as part of a guided tour which lasts about an hour and begins at the top of every hour. Slots on these tours can fill up quickly at busier times of year, so to avoid disappointment we would recommend booking in advance, which you can do on their website. If you don’t want to do the tour, the temporary exhibitions can be seen on a self-guided visit. Holders of the Dublin Pass get free entry, however you should call or e-mail the museum to reserve a time slot if you want to take a guided tour to guarantee a time slot. 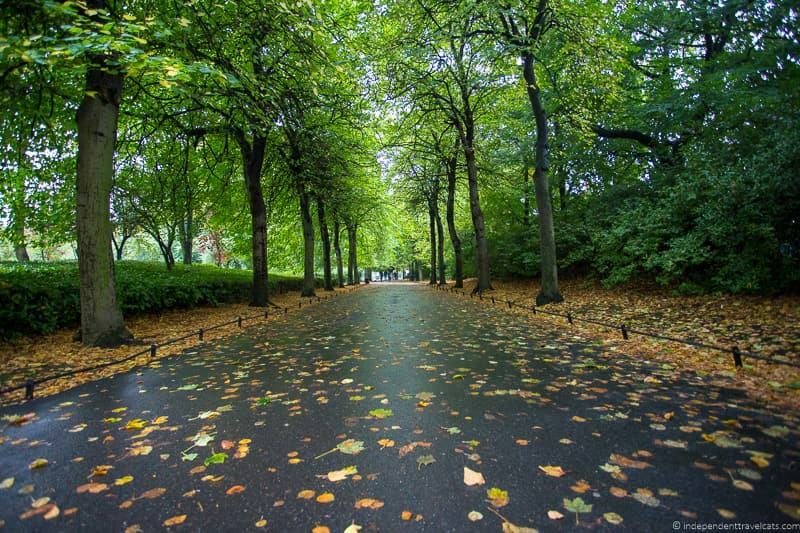 Once a marshy common grazing area, St. Stephen’s Green is one of the Dublin’s most popular green spaces and a nice place to take a short break from sightseeing. It includes trees, a lake, a playground, a number of labeled plants (including some in Braille), fountains, statues, and memorials. This city center park is located just across from the Little Dublin Museum. Those who enjoy gardens and green spaces might want to also visit the nearby Iveagh Gardens, a Victorian era garden featuring a rose garden, cascades, and yew maze. The garden is free to visit. We recommend using the afternoon for time to visit a museum or two. Dublin offers a number of free museums which include three locations of the National Museum of Ireland, the National Gallery of Ireland, and the Irish Museum of Modern Art. You can’t visit all of these museums so I’d based your choice on your interests, time, and location. In terms of today’s itinerary the nearest museums to St. Stephen’s Green (10 to 20 minute walk) are the National Gallery of Ireland, National Museum of Ireland – Archaeology, National Museum of Ireland – Natural History, and Dublin City Hall. But you can adjust the itinerary to fit as needed. All the museums mentioned offer free general entry at the time of writing. Temporary and special exhibitions usually require a ticket and fee, and these are normally free for those with Dublin Passes. National Museum of Ireland – Archaeology – This museum tells the history of Ireland through archaeology, presenting a wide range of objects from metalwork to weapons to religious objects to preserved Iron Age “bog bodies”. Includes objects from Ireland as well as those found in other parts of the world. National Museum of Ireland – Natural History – This museum houses a large collection (around 2 million specimens) of zoological and geological artifacts and exhibits collected from around the world. National Museum of Decorative Arts & History – A museum that will appeal to both art and history lovers. It is filled with decorative arts, jewelry, furniture, costumes, weapons, Asian art, & history exhibits. Dublin City Hall exhibition – An interesting exhibit that tells the story of the city of Dublin from the first Viking invasion to the fights for Irish independence to modern Dublin. 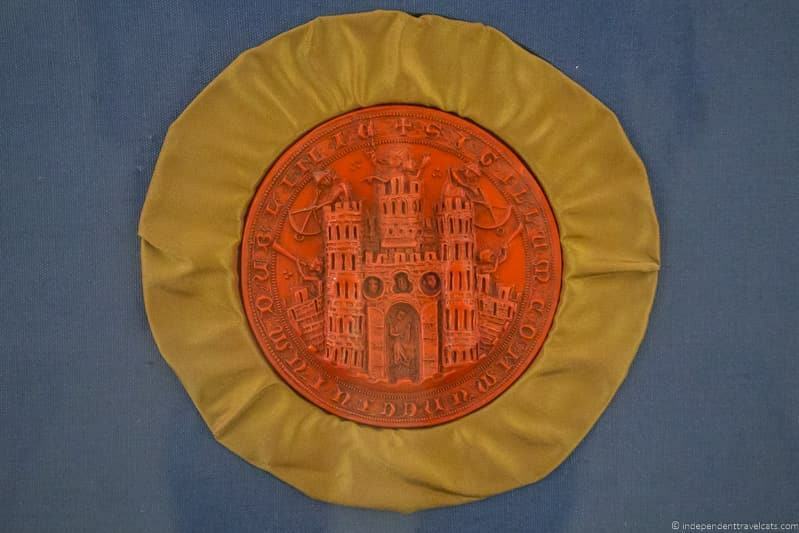 Notable artifacts on display during our visit included the Seal of Dublin City, the Great Mace of Dublin, The Sword of the City, and one of the original Proclamations from the 1916 Easter Rising. Note the City Hall suspended its entry fee in 2016 and was still free when we visited last in 2017 but the entry fee may be reinstated in the future (free for Dublin Pass holders). National Gallery of Ireland – This is Ireland’s national collection of Irish & European art, including works by Burton, Turner, Monet, and Caravaggio. This would be my choice if I was only going to visit one art museum in Dublin (although modern art lovers would probably prefer one of the other museums). Irish Museum of Modern Art – Ireland’s largest collection of modern and contemporary art by both Irish and international artists located in a 17th century hospital building arranged around a large central courtyard. A good bet for modern art lovers. Hugh Lane Art Gallery – A contemporary and modern art museum housed in a 18th century former home that includes the Francis Bacon studio. Founded in 1908, it is believed to be the first public gallery of modern art in the world. 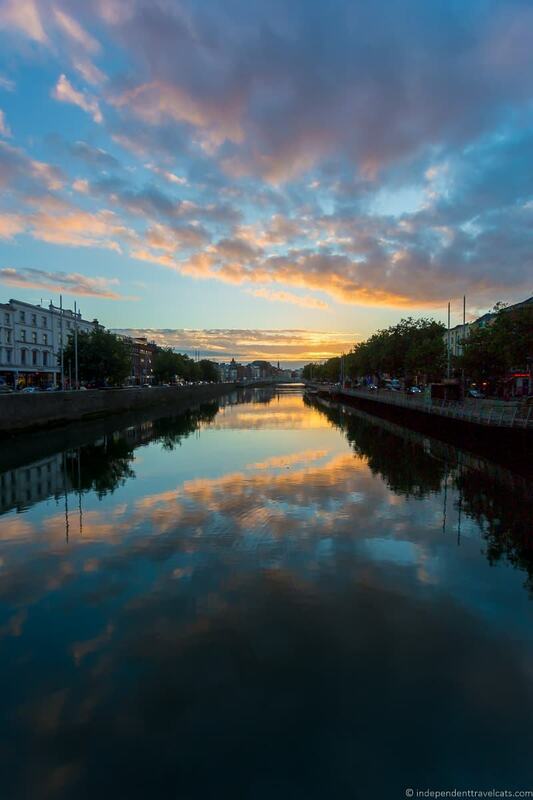 We’re coming to the end of the second day of our three day Dublin itinerary, and what better way to finish off than by watching the sun set over the River Liffey, which runs right through the center of the city. If the weather is good, we can highly recommend taking a moment to enjoy the sunset view of Dublin. Most of the city center bridges along the River Liffey will offer you a good view. The most famous bridge is the Ha’Penny Bridge, a cast iron pedestrian bridge built in 1816. You might also want to take a boat tour of the river during your trip to Dublin. 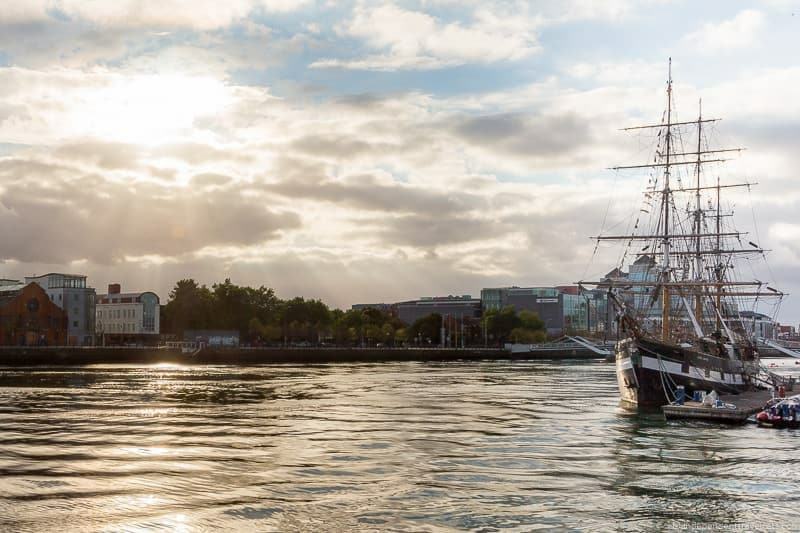 If you are interested in taking a boat tour of the River Liffey or exploring the beautiful Dublin Bay (a UNESCO Biosphere Reserve), there are a number of boat tour options in Dublin, including dinner cruises. Just be sure to book in advance. If you are not too tired and want to experience some of the Dublin nightlife, we recommend exploring the popular Temple Bar District. It is a good place discover the “craic”, the all-encompassing Irish word for having a good time. This is the party capital of Dublin, and if you’re seeking out pints of Guinness, live music, and lots of the aforementioned “craic”, this is definitely the place to come. Yes, the prices are higher than everywhere else in town, and it’s also going to be full of tourists. But there are plenty of locals out here too, and you’re pretty much guaranteed a good time. 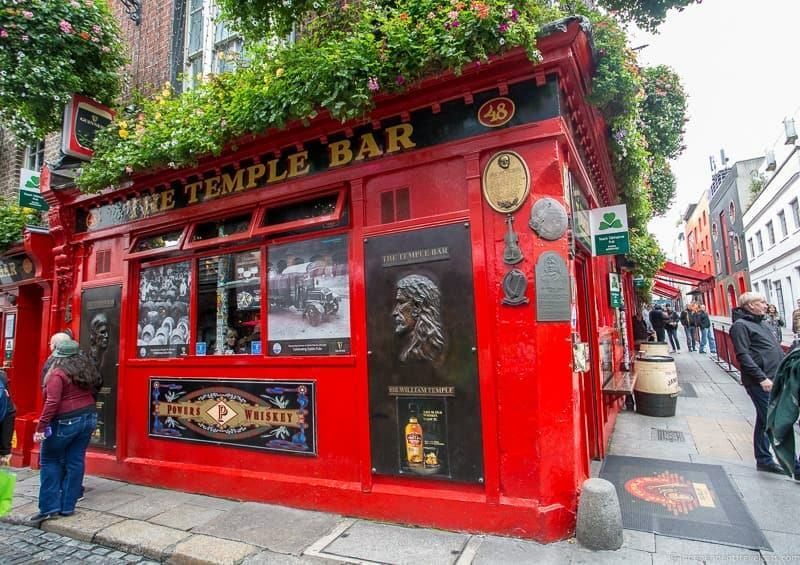 The most visited bar is The Temple Bar, but there are loads of bars in this area to grab a pint and many also offer food. A few others to consider are The Palace Bar, a traditional Victorian-era pub, The Brazen Head which is believed to be Ireland’s oldest pub dating back to 1198, and Buskers which offers a more contemporary bar atmosphere with modern cocktails. On the final day of our Dublin itinerary, we recommend crossing the river to explore the area of central Dublin north of the River Liffey. In the morning, we recommend learning a bit more about Dublin’s history by visiting a few of the recommend museums to learn about Ireland’s emigration history, the 1916 Easter Uprising, and Dublin’s rich literary history. It is a busy morning/afternoon if you want to visit them all so if you want a more relaxed day, I’d choose the attractions that are of most interest rather than trying to visit them all. Then later in the afternoon we recommend sampling some Irish whiskey and then going out for a night of traditional Irish food, drink, and entertainment. The Jeanie Johnston tallship (fee*) is a remake of the original Jeanie Johnston, a three-masted sailing ship that was originally built in Quebec, Canada, in 1847. It was one of the so-called “famine ships”, which was used to transport emigrants between Ireland and North America. During the Great Famine in Ireland from 1845 to 1849, about one million people died in the country and a million more people left Ireland to seek a new life, primarily to the United States, the UK, Canada, and Australia. Liverpool was a particularly popular city for emigrants and it is estimated that today about three-quarters of the population has Irish roots. 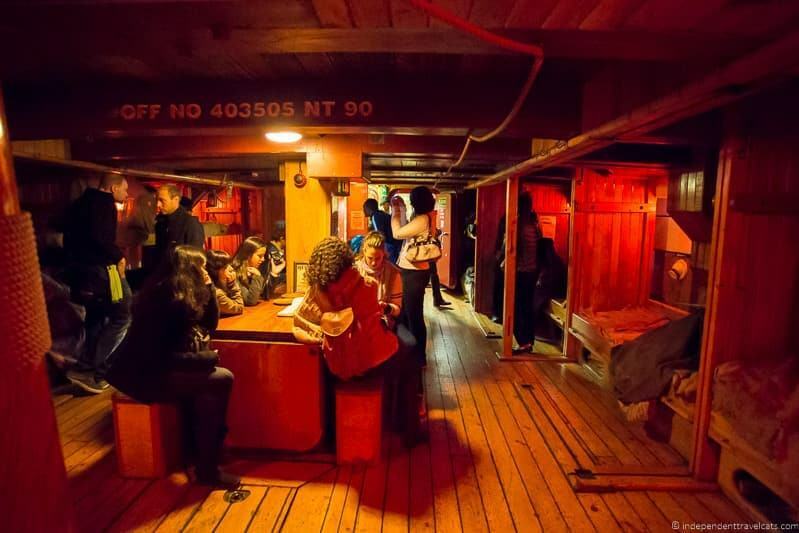 Today you can take a guided tour of this replica ship built in the 1980’s, and learn about life on board for both the emigrants and crew. The Jeanie Johnston made 16 voyages carrying emigrants across the Atlantic to North America, and she was particularly noteworthy as she didn’t lose a single passenger or crew member on any of her voyages. It can be quite a moving experience, particularly if you had family who would have undertaken a similar voyage. On our tour, one of our fellow tour participants became quite emotional when he revealed that his ancestors had actually sailed on one of the original famine ships from Ireland. Visits are given as part of a guided tour which lasts about 50 minutes. Be sure to check on tour times before you visit. Ireland has experienced a number of periods of mass emigration, not just during the Great Famine, and many Irish people continue to emigrate. 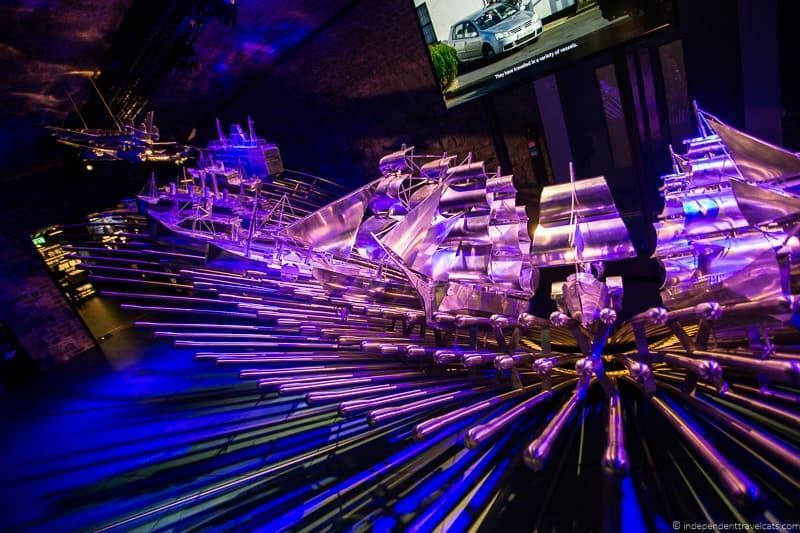 If you want to learn more about the Irish emigration experience, EPIC The Irish Emigration Museum (fee*) is a museum that tells the story of Irish emigration around the world. Ireland is a country that has had its fair share of troubled times and this has led to an estimated 9 to 10 million people having emigrated since 1700! Through a self-guided interactive experience, the museum guides you through the personal stories of many people who have emigrated and their journeys. 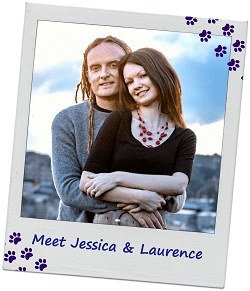 You’ll learn what caused them to emigrate, what that process was like, and what their new lives were like in their new home country. If you’ve ever visited Ellis Island in New York and learnt about immigration into the USA, this is a great counterpart to that experience. We both enjoyed the museum, and learned a great deal. The museum is located in the CHQ building which is also home to several restaurants and cafes if you are looking for a convenient coffee, meal, or snack after your visit. Trying to find out more about your own Irish heritage? If you are specifically trying to find out more about your own Irish heritage, you might want to stop in at the Irish Family History Centre afterwards (located near the EPIC gift shop) to look up genealogy information. You can also book a private consultation with a on-site genealogist for more assistance. 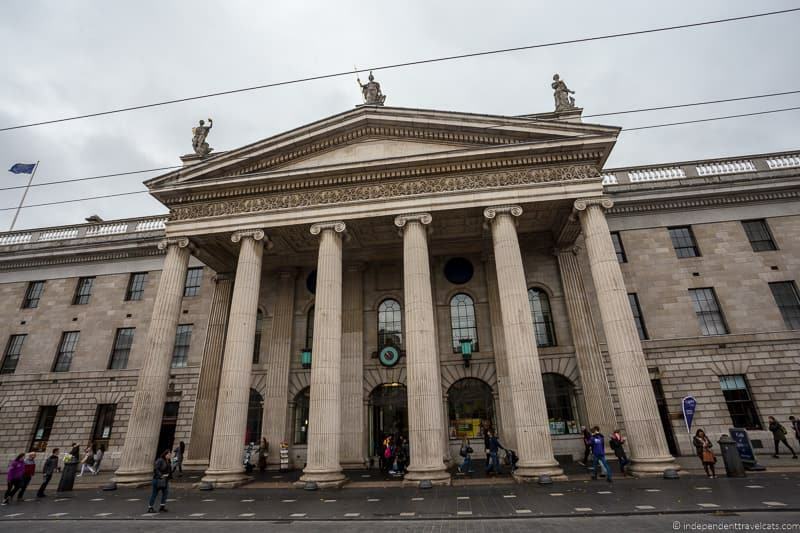 If you’re interested in learning a little bit more about 20th century history in Ireland, particularly the 1916 Easter Rising, a visit to the GPO Witness History Museum (fee*) should be high on your list. This is found in Dublin’s General Post Office (GPO) on O’Connell Street, a beautiful Georgian building built in 1814 and one of Ireland’s most famous buildings. In the self-guided exhibition you’ll learn all about the events of the 1916 Easter Rising as well as the events leading up to the uprising and the subsequent effects. On Easter Monday 1916, a group of Irish republican rebels who wanted Irish independence from Great Britain stormed the GPO and seized control of the building. This forced occupation lead to a bloody 6 day affair, which lead to the death of over 450 people which included civilians, British military officers, police, and rebels. The exhibition uses direct witness accounts, documents, and interactive exhibits to tell the story. There’s also a memorial to those who were killed in the rebellion, including an outdoor sculpture for the children killed. It’s an informative and interesting experience, and definitely worth a visit for those interested in this period of Irish history. There is also a cafe on the ground floor, and we enjoyed coffee and pastries here after our visit. Time for some literary themed attractions. Ireland is famous as being a nation of storytellers and Dublin is a UNESCO designated City of Literature. 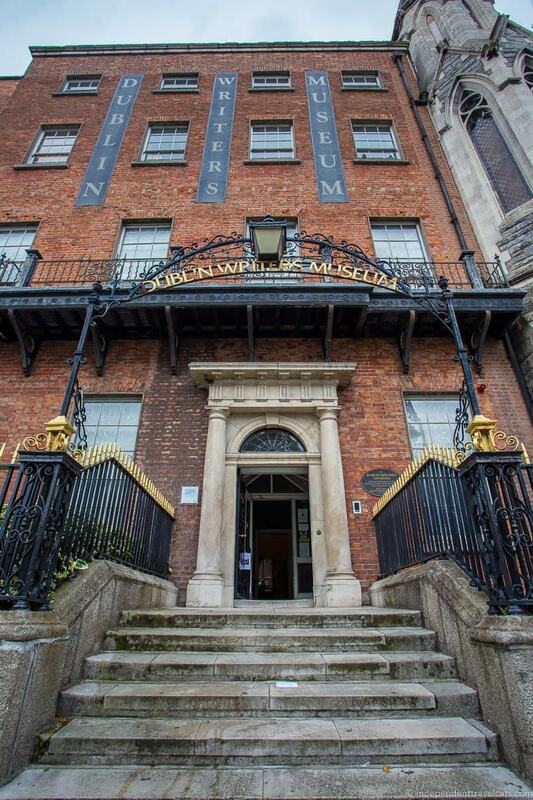 One of the best places to learn about the literary heritage of Dublin is at the Dublin Writers Museum (fee*). 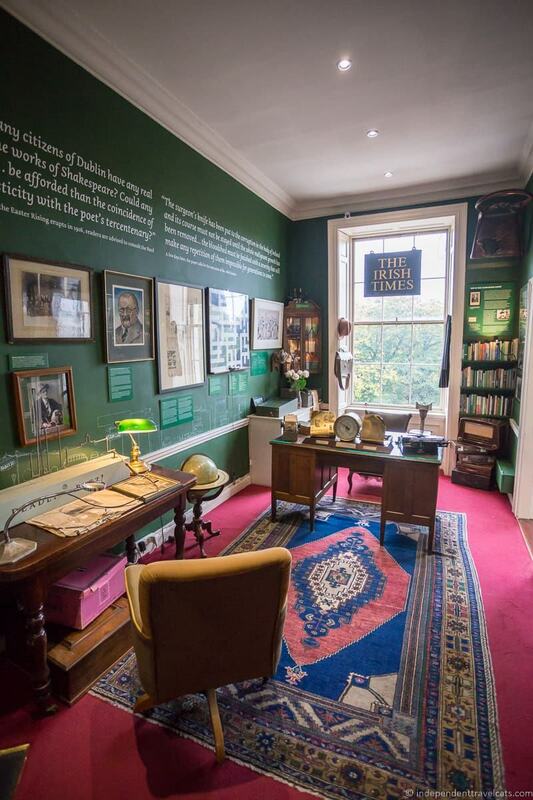 This museum has displays dedicated to some of the most notable writers in Irish history, including James Joyce, Jonathan Swift, George Bernard Shaw, Oscar Wilde, and William Yeats to name but a few. It is housed in a beautiful 18th century mansion on Parnell Square, and is next door to the present-day Irish Writers Union. For anyone with an interest in writing and Ireland’s literary heritage, this is definitely a museum not to be missed. Visits are self-guided and tickets can be purchased on-site. If you want to learn more about Irish writers, you might want to seek out information on specific writers. 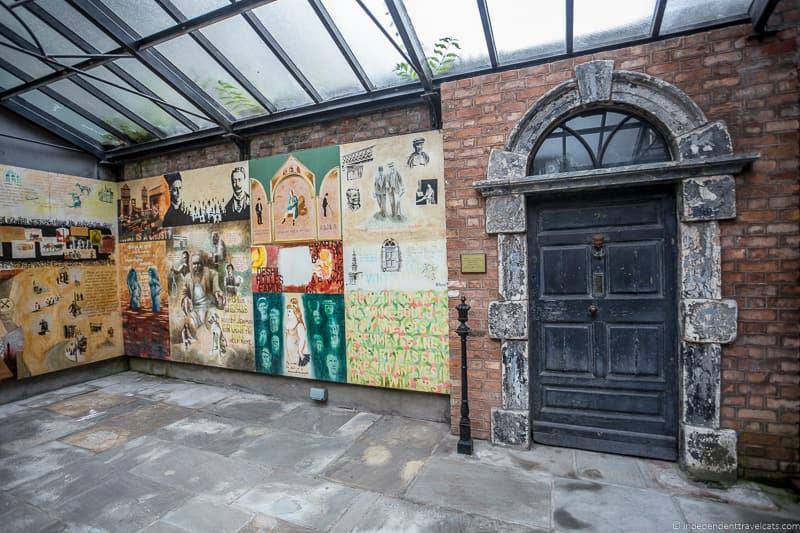 One of the most famous Dublin born writers is James Joyce who wrote the 20th century classic Ulysses (free on Kindle), and the James Joyce Centre (fee*) is dedicated to the author and his writings. Here you can learn all about both the life of James Joyce, as well as his famous novel, told via film and exhibits. The museum also has the front door from No. 7 Eccles Street on display, which readers of Ulysses will know as being the home of protagonist Leopold Bloom. Other Dublin Literary Spots? If you are looking for more literary spots consider visiting the National Print Museum, doing a Dublin Literary Pub Crawl, seeing some of Dublin’s beautiful libraries (Trinity’s Long Room, Marsh’s Library, Chester Beatty Library), or browsing for books at some of Dublin’s many popular book shops. The birthplace museum of George Bernard Shaw (33 Synge Street) was closed several years ago but there are hopes that it will re-open. But even if closed, you can see the plaque outside as well as many others literature related plaques in Dublin such as the one on Bram Stoker’s birthplace at 15 Marino Crescent (private home) and the plaque at Oscar Wilde’s childhood home at Number 1 Merrion Square (owned by the American College Dublin). Time to learn about (and drink!) another famous Irish beverage: whiskey! One of the most well-known Irish whiskeys is Jameson’s Whiskey, which you can learn about and sample at the Jameson Distillery on Bow St. This is a fully guided tour through the former Jameson Distillery at which you’re going to learn all about the history of Ireland’s most famous whiskey, which was distilled at this site from 1780 until 1971. 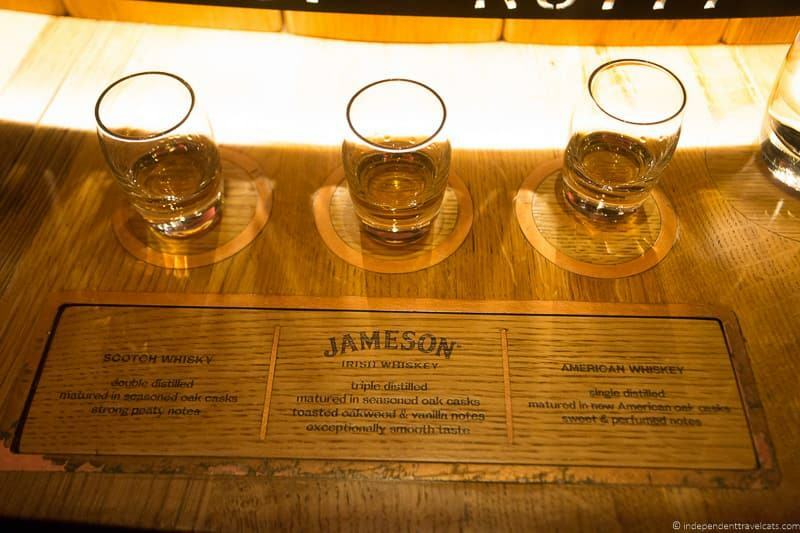 The tour is a lot of fun, and you get to try Jameson’s whiskey, as well as compare its flavor to other leading whiskeys to see if you can tell the difference. At the end of the tour you also get a whiskey to enjoy at the bar at your leisure. Tours can be booked online, which is the best option to avoid disappointment as this is a popular attraction. Although you can also buy tickets and book a tour on arrival. Holders of the Dublin Pass have a free tour included. Want more Irish Whiskey? If you are interested in Irish whiskey, there are several other whiskey experiences and tours you can take in Dublin in addition or as an alternative to the Jameson Distillery tour. If you are interested in visiting an active whiskey distillery, you might try the distillery tour and tasting at the Teeling Whiskey Distillery (fee*) which opened in 2015 and is the first new distillery in Dublin in 125 years. A free Teeling distillery tour and tasting is available for Dublin Pass holders. Other Irish whiskey experience options include the Irish Whiskey Museum Experience (fee) and taking a whiskey tasting tour (fee) with a local around Dublin’s pubs. Book any of the whiskey experiences or tours in advance if you can as they are all popular. Not interested in Whiskey? If whiskey is not of interest, I’d skip this visit. You can spend more time at the prior attractions or alternatively consider sitting down to relax for an afternoon tea or a coffee nearby, visiting Dublin Zoo (fee*) within Phoenix Park, visiting the National Botanic Gardens of Ireland (fee*), or exploring one of the city’s many free museums (see Day 2 list). Ok, we’re coming to the end of our three days in Dublin! How about going out with a bang, and celebrating all that is fun in Dublin, with a night of Irish food, drink, and some traditional Irish entertainment? 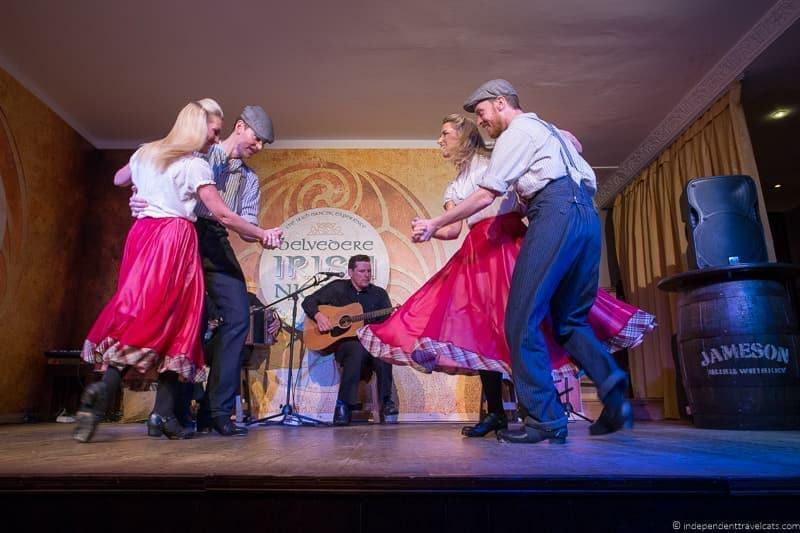 There are a number of locations offering various types of traditional Irish evening entertainment whether you just want to find a pub with some live music or you want to go to an entertainment show. We’ve attended the Traditional Irish Night show at Dublin’s Belvedere Hotel and you can read about our experience. We also heard good things about Taylor’s Irish Night, although this is located a little south of the city center. Other options include the Irish House Party dinner and show, a dinner cruise on a canal barge, or an evening pub crawl with traditional Irish music. We think a great way to save money is on sightseeing with discount passes and cards. Our recommended way to save money on sight-seeing in Dublin is to invest in a Dublin Pass. We’ve used these on a couple of occasions when visiting the city, and for a 3 day trip that includes visiting a number of attractions, the savings can really add up. You can read our Dublin Pass review for more information. As noted before, the Dublin Pass is popular among travelers to Dublin and one we recommend for active sightseers to the city. We wanted to give you an example of the cost savings over 3 days in Dublin if you have a Dublin Pass. 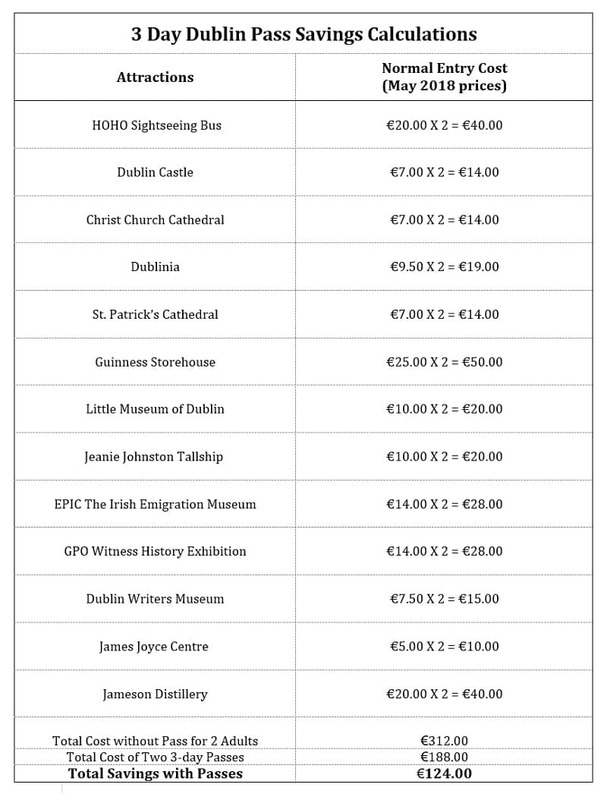 if you used the sightseeing bus and visited all of the main attractions listed on the suggested 3 day Dublin itinerary included in the Dublin Pass, it would cost you €156.00 at normal adult admission prices (May 2018 prices). A 3-day Dublin pass currently costs €94. This means you would save €62.00 per person or €124.00 for 2 adults! 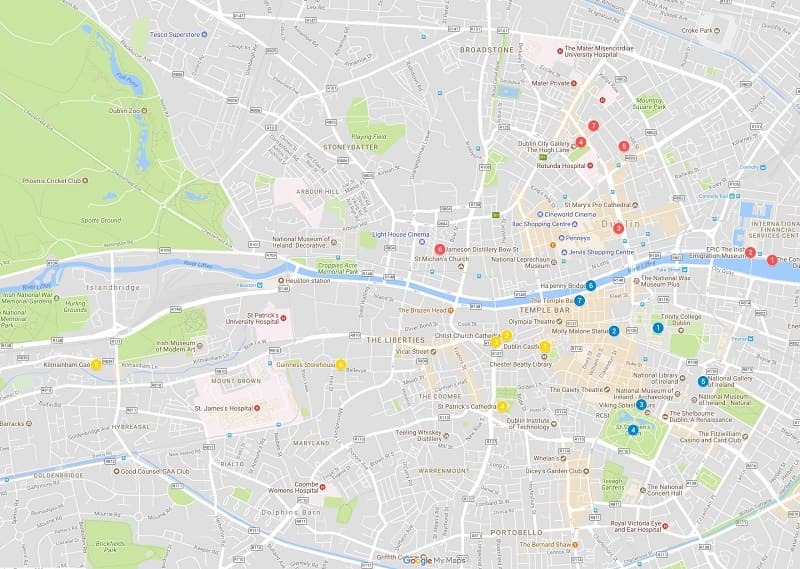 Obviously you might not want to visit all the sites listed, but you can see from the above that even if you visited fewer sites, you would still save money with the pass if you plan to visit a number of attractions in Dublin. The pass can also save you time by allowing you to skip the ticket lines and join fast-track lanes at many sites. Definitely a discount pass worth checking out before your trip to Dublin. And that’s the end of our 3 day Dublin itinerary! Hopefully this Dublin guide and itinerary has given you a good idea for what you can do with 72 hours in Dublin. What would you do with 3 days in Dublin? Have you been do Dublin? If so, what were your favorite things to do? If you are planning a trip to Dublin, feel free to reach out with any questions as you plan your trip. Just type any comments or questions in the Comments section below and we’ll be happy to answer them. Tips on Using & Buying the London Pass: Is it Worth It? Your article is very helpful. I will be visiting in February for 6 1/2 days- along with my daughter and her friend (18 year old). I have printed out the map and 3 day itinerary. We are just doing one big day trip up to Belfast and Giant’s Causeway and I booked a day/time for the Goal. Other than that we are just going to wing it. Great, glad to hear that you are planning another trip to Ireland, sounds like you had such a great experience back in 2017. There is plenty to do and see in Dublin and surrounds without a car. Laurence also recently wrote a Dublin Pass review which may be useful in saving money since you will be in the city for several days. We also have a post on things to do in Belfast and a guide to highlights of the Causeway Coastal Route that may be of interest for your day trip to Northern Ireland. this information seems to fit the bill for me. I will be 80, still active, and do not want to play mountain goat and climb mountains or explore very large castles. I do use tours as they provide transportation for me. I would also like information on seeing Belfast and Waterford. these are the cities that interest me the most and I know I would be able to see. thanks for all that you can provide. Glad you are finding our Dublin itinerary helpful for planning your time in Dublin. You can reach both Belfast and Waterford easily by train from Dublin, or you can join a guided tour from Dublin. We have a guide to the top things to do in Belfast as well as a suggested 2 day itinerary that you can check out. If you’d like to do a day tour to Belfast or 2 day tour, we’d check out these options on GetyourGuide and Viator. Some also visit other destinations in Northern Ireland like the Giant’s Causeway, Castle Ward, and the St. Patricks Centre. We don’t have any posts on Waterford Ireland although we did get some Waterford crystal when we were last in Ireland 😉 You can get to Waterford by train on your own or you can take a guided day tour from Dublin, such as this one (by train) or this one (by coach). Hope that helps, and let us know if you have further questions. Wishing you a wonderful trip to Ireland. Thank you so much for this! It is so helpful in our planning! I can’t seem to find your write up for the day trip to the cliffs of Moher. I’d love to learn how you chose to do that. We love visiting Dublin Ireland and this post lists some of our favourite places! We also made time to go on a wonderful pub tour in the wicklow mountains with Rural Pub Tours. Its a small group tour which enables you to see unique pubs that would otherwise be difficult to get to. Shane is the owner and driver and he is so much fun. 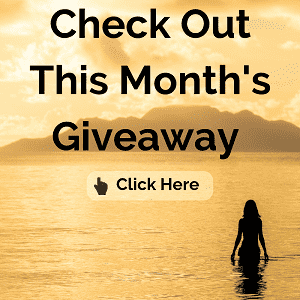 If you decide to check it out, you won’t be sorry! This is an awesome itinerary! Although, we could be entirely happy just stumbling around Dublin for a few days. It’s such a great city, at once charming and exciting, historic and modern. What we didn’t do – but will next time – is invest in the Dublin Pass! Besides the savings, we find the passes often get us to go places we might otherwise pass by. Pinning this one for later – Thanks guys! Amazing, Dublin is a must visit the place, from the beautiful historical monuments to museums, picturesque landscapes to the trendy flea market. Visiting Dublin is a treasure, I have been there and fall in love with the astonishing city. What a treasure trove of incredible information! I visited Dublin a few years back, but would love to go again. I especially loved the experience at the Guinness Storehouse! 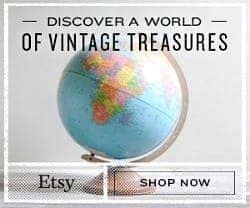 I pinned this for my next trip there, thanks! Thanks for creating this great guide to Dublin Jessica and Laurence :). I also recommend going to see a play (often with fantastic actors) at the Abbey Theatre or at the Gate Theatre. Temple bar can be fun but drinking there is expensive. A couple of good pubs with live Irish music: O’Donoghues Bar or The Cobblestone. Two great traditional pubs: The Brazen Head or Mulligan’s. My first impression on discovering Dublin: grey buildings, grey sea, grey sky. But don’t let that put you off, Dublin is an old city with a young population and lots on offer. You’ll leave with a warm fuzzy feeling. Hi Nath, Glad you enjoyed our Dublin itinerary and thanks so much for those great recommendations! We’ve been to The Brazen Head but not the other pubs you recommend, only so many pubs you can visit each time 😉 We’d love to see a play or other performance in Dublin at one of the theatres – and will try to do that on our next trip. Great guide for visiting Dublin. A lot of useful information in it, like always. It’s good to know what the Dublin pass covers. I didn’t realize you would need to a voltage converter in Ireland. Hi Anda, Yes, Dublin has a lot to offer and the Dublin Pass can be a good investment if you plan to visit a number of the covered attractions. We’ll probably use it again on our next trip to Dublin as there are still several sites we haven’t visited that are included on the Pass. Yes, like all of Europe (and most of the world), Ireland uses 220v but some countries (particularly the USA) do not and the USA uses 110v. You don’t want to plug a 110v applicance into a 220v outlet or vice versa without a converter. You could damage the device and/or the electrical system (I’ve accidentally ruined a handheld water heater and flat iron this way over the years). Now the good news is that most newer electronics are dual voltage these days meaning that work with both 110v and 220v (e.g., laptops, tablets, phones) but most other things (e.g., curling irons, flat irons, hair dryers, DVD players, some phone chargers) are not. It should be labeled on the device or in the manufacturer’s book. We buy dual voltage appliances or have two of things (e.g., flat irons) for the things we travel with a lot. Wow such a comprehensive list of attractions in Dublin, one of my favorite cities. I have been a few times but did not know about some of the museums you mentioned. I will have to check them out on my next trip.